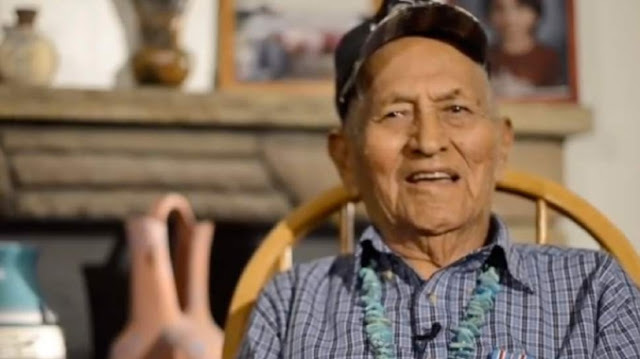 A Navajo man who helped stump the Japanese during World War II using a code based on his native language has died in Utah. Born in Naschitti, New Mexico, Yazhe joined the U.S. Marines when he was 19 years old. He became one of the hundreds of Code Talkers who played a vital combat role by transmitting battlefield messages in an unbreakable Navajo-based radio code. Navajo Nation authorities said Friday that all flags there would be to be flown at half-staff from Jan. 19 to Jan. 22 to honor Yazhe's memory. "The Navajo language was the secret weapon that brought victory to the Allied Forces and ended the war in the Pacific," said Vice President Jonathan Nez in a statement. The group began with 29 recruits in the spring of 1942. Yazhe joined in September of that year, after he graduated from the Albuquerque Indian School. There were at least 440 Code Talkers. Fewer than 20 are still alive. His older brother Harrison Yazhe, who died in 2004, also became a Code Talker. Both brothers' names appeared in the Congressional record on the list of Code Talkers confirmed by the Marines. A third brother, U.S. Army Pfc. Silas Yazzie, died in combat in Italy in 1944. The brothers had slightly different last names because officials with schools or the military recorded them with different phonetic spellings over the years, his family said. Ernest Yazhe served in Guam and Okinawa campaigns, and once heard Japanese soldiers utter the words "Code Talkers" as they discussed the transmissions. The Japanese were "sorry that they couldn't understand it," he said in a 2013 video produced by the Utah National Guard. After Japan surrendered, he helped repatriate Japanese prisoners of war in China. Discharged as a corporal in 1946, Yazhe came to Utah for work at a school in Brigham City where he met his wife Katie Trujillo. They raised seven children together as he worked for Kennecott Utah Copper for 38 years. Ernest Yazhe didn't talk much about his combat experiences after the war, though he did say he served on the front lines and took enemy fire, said his son-in-law Joel Frank. He may have stayed quiet in part because the program remained classified until 1968. "He just kind of put it in the back of his mind and he never talked about it," Frank said. 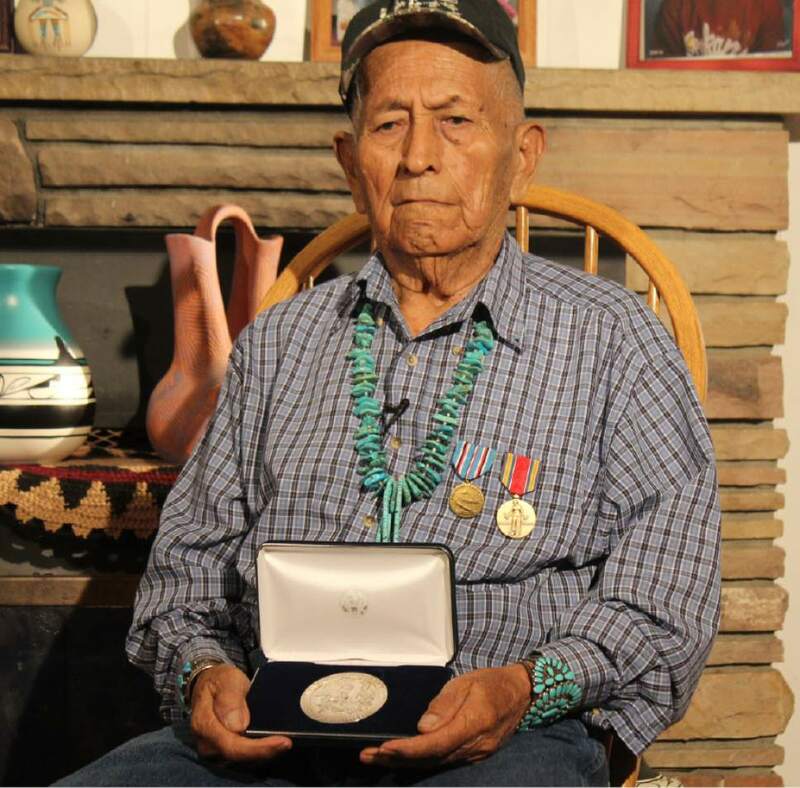 Ernest Yazhe didn't often attend Code Talker reunions, but he did go to Window Rock, Arizona, for a 2001 ceremony presenting Code Talkers with the Congressional Silver Medal, said Melissa Yazzie. His survivors include six siblings and six children as well as grandchildren and great-grandchildren. Responses to "Ernest Yazhe, World War II Navajo Code Talker Hero Passes at Age 92 "
RIP, Brave and Beautiful Person. Thank You for sharing and thus honouring his memory. I live in Switzerland and there are still many things we don't know about your culture other than what we see in movies, and what you accomplished overhere in WWII. The code talkers were men of remarkable courage and integrity. We want to recognize their incredible contribution and honor them for their dedication and sacrifice. God bless each one, now and forever.